Back in February of this year, there was an unexpected controversy around the installation of a sculpture by Canadian artist Tim Schmalz called ‘Homeless Jesus’. The piece was placed in front of St Albans Episcopal Church in Davidson. Unfortunately, it also made the news across the country and internationally with the unfortunate tag line of “somebody called the cops on Jesus” when someone phoned the police after mistaking the statue for a real homeless person. While the vast majority of local comments were supportive of the statue, not everyone thought it was appropriate. Some did not like the location. Others said they did not like the idea of Jesus being portrayed as vulnerable or needy. Many supporters said it made them think more about the homeless, or that it was a good conversation starter on a subject that too often gets pushed into the shadows. Particularly here in North Mecklenburg where there may be fewer visible occurrences of homelessness to remind people on a regular basis, the statue certainly could serve that purpose. However, the real value in that sculpture would be realized if it inspired people to actually do something rather than just talk about its artistic or religious merits. On this Christmas Day, readers should know they have the opportunity to do just that by volunteering for the Room In the Inn program run through Urban Ministries in in Uptown Charlotte. Room in the Inn (RITI) recently started up its annual program to provide shelter during the winter months for those in need. Through this program, houses of worship and other organizations open their facilities for the night and provide a warm place to sleep along with three meals (dinner, breakfast, and a bag lunch). “Neighbors” as the guests are called can get a hot shower and pick up things like extra toiletries if needed. A night at a RITI facility provides a much needed respite from the street, and unfortunately there is too much need for these services. Last winter nearly 1500 different people took advantage of the program. To pull off that kind of effort is no small feet. A single night at a single facility takes many volunteers - drivers to and from the Urban Ministry Center, people to setup, people to bring dinner, one or two volunteers to spend the night with the neighbors, and people to help with early morning breakfast preparation and cleanup. It could take as many as a dozen different people to get it all done. Most facilities who participate in RITI are only able to do a few nights a week – at most. Some may only be able to do one or two. However, it is cold every night during the winter. One big reason more nights cannot be offered is that it takes a lot of people to fill all those volunteer spots. In Huntersville, Cornelius, and Davidson there are fifteen different organizations participating in Room in the Inn. If you are looking to do something different in the coming year, seek out one of those groups and offer to help this winter. Even if it is once a month or only once or twice a year, that can make a real difference. If enough people were to do just that much, more of those facilities that have the space available might be able to do more nights. Unlike Mary and Joseph who were having trouble finding a place to stay on that first Christmas Eve, more people who need it would then be able to find a Room in the Inn. With 2014 elections just now in the books, it is already time to start looking to the next round of US Senate contests. Earlier this week, the Senate Conservatives Fund, founded by former SC Senator Jim Demint, sent out this survey targeting the senior NC US Senator, Richard Burr. The survey titled "North Carolina Grassroots Survey" appears intended to gauge enthusiasm among conservatives for a primary challenge when Burr comes up for reelection in 2016. Among the most inflammatory of the statements in the survey was Burr's donation of $20,000 to a PAC supporting the Thad Cochran campaign in the Mississippi runoff last June. Money from this PAC was used to purchase adds implying that Cochran's opponent, conservative Chris McDaniel, was a racist. They were probably the worst adds run in the entire country by any campaign, and they were run by the Republicans against one of their own for no other reason than maintaining political power for the Republican establishment. The Mississippi contest was not a case where Republicans might lose a seat if the so-called Tea Party candidate was the nominee. Mississippi is deep red as a state, and McDaniel would have won the general election if he had been the nominee. Mississippi was the worst example of incoming Senate Majority leader Mitch McConnell's pledge to the liberal New York Times last March to "crush them everywhere" - speaking of conservatives. Soon after that rant he also began running ads targeting the SCF specifically. When it comes time to support candidates for 2016, conservatives and establishment Republicans need to remember where Senator Burr stands on the issues raised in this recent SCF survey. Remember that your money may get spent on adds like the ones Senator Burr helped pay for in Mississippi. Well, it was bound to happen sooner or later. When you write a column like this one that regularly pokes and prods local government to do the right thing, eventually they poke back. That finally happened on the recent column regarding the Town of Davidson’s proposed planing ordinance changes. Last week, Town of Davidson senior staff was quoted in another area publication on the topic of the controversy surrounding the proposed changes, and it was pretty clear that staff took issue with what yours truly had to say. Those same concerns were never expressed to me directly, but then again, I suppose that's to be expected too. The person who was quoted, Assistant Town Manager Dawn Blobaum, happened to be the person who I pointed out helped found the local office of the Lawrence Group – the consulting company that has done a large amount of work for the town over the years. The other person quoted extensively in the other publication’s article was recently retired UNCC professor David Walters. Walters also has a long history with that same consulting company. Now let’s be clear, there is not anything intrinsically wrong with using consultants. However, it does show that in this case staff and the consultants they use are cut from the same cloth. It does show that they would likely approach things with the same world view. Fortunately for us - the citizens – unelected staff and their ideologically-driven paid consultants do not set policy. That is the responsibility of our elected officials. On that note, I will take the generally positive feedback received from a majority of Davidson Commissioners on my earlier piece as a good sign the points made were valid concerns. That feedback was received both before and after the piece was published. Frankly, since commissioners are the ones who will vote on the proposed changes, that’s the feedback that matters most. That brings me to the second point regarding the columns I write. When the Weekly Herald approached me with the idea of writing a regular column on local issues, I will admit it was a pleasant surprise. It was validation that maybe a few more people than readers of political blogs might be interested in the topics I typically cover. When the subject of money came up, I told them that I would do it for free. The Herald does not pay me a dime. My writing over the years has focused on bringing more transparency to local government and trying to provide readers a window into how things really work The possibility of encouraging more people to take an active role in their government makes any criticism directed at me well worth it. Make no mistake about it, pushing for change and trying to get government to act more transparently is a task that involves many more losses than wins. Though, wins do occur. The most obvious recent one would be the property tax revaluation refunds issued this year by the County and local municipalities – refunds that absolutely would not have occurred if not for the tireless work of local citizens to get the flawed 2011 revaluation corrected. Another would be the citizen pushback that resulted in Davidson abandoning a 2012 push by officials to implement 4-year staggered terms for Commissioners and the Mayor. That change by it's very nature would have prevented voters from ever voting out a majority of elected officials in a single election – even if they had made decisions that deserved such a result. I recently told one local Commissioner that controversy over issues like the ones currently being discussed in Davidson could easily be avoided if government simply put out information they know will be controversial in a more easily accessible way. Give your average resident a realistic chance to understand what is being done without forcing them to weed through a ton of technical information and then controversy is much less likely. An example of how that could be accomplished actually occurred on December 9th at the second half of public hearing on Davidson’s planning ordinance changes. On the subject of allowing corner retail in the Village Infill area, Commissioner Cashion asked planning staff how many corner lots are currently vacant. Vacant lots allow for the maximum square footage of retail under the proposed changes. The number and location of these lots may be the most obvious question to ask about this section of changes. Maybe the answer is buried in the detailed documentation somewhere. After two years of work, one would certainly hope so. However, until those kinds of obvious questions start being answered before they are even asked, there will always be room for columns like the ones featured here. This post originally appeared in this week's Herald Weekly!. With the dust finally settled on our national elections with the runoff in Louisiana, it is time two look forward to a new US Congress and State General Assembly. This past election saw Republicans maintain their super majorities in both houses of the State Legislature. They also added a Representative in the state’s Congressional House delegation in addition to winning a second US Senate seat. That's a significant change from just a few short years ago. In fact, North Carolina has seen one of the more dramatic changes of any state in the country as far as the party of our elected officials with lawmaking authority is concerned. With that in mind, it’s worth taking a look at how we got here. It ultimately comes back to a national effort aimed at state-level legislative politics. Most people who follow politics are now familiar with the political map being shown on any news show discussing the US House of Representatives – the one that shows a sea of red Republican seats with the smaller number of blue Democratic seats centered along the coasts and around a few urban centers. That map is no accident. It is the result of a concerted effort by Republicans over the past several years – an effort called REDMAP or the REDisticting MAjority Project. REDMAP originated with the Republican State Leadership Committee (RSLC) after the 2008 elections in preparation for the 2010 Census, and its subsequent constitutionally required redistricting. The goal was to gain control of more state legislatures and influence the redistricting process across the country to draw more Republican-friendly districts at the State and Congressional levels. The REDMAP effort was greatly enhanced by th.e Obamacare fueled Tea Party wave that swept the country during the 2010 election season. The end result for North Carolina was the first Republican controlled Legislature in 140 years. Redistricting ensued, and the past two Federal and State election cycles have occurred under the new districts. the Democrats going into the 2010 elections to 10 – 3 favoring the Republicans after the 2014 cycle. Over these same cycles, Republicans have secured election-tested, veto-proof super majorities in both houses of the Legislature. For its intended purpose, REDMAP cannot be considered anything but an unmitigated success for the GOP here in North Carolina. So, how has this impacted voters choices here in North Mecklenburg? Here, the results have been more mixed. On the Congressional level, the NC 9th has the dubious distinction of being one of 77 House districts nationwide (and the only one in North Carolina) where one party ran unopposed in 2014. Between the heavy Republican slant of the district, and Congressman Robert Pittenger’s proven willingness to spend whatever it takes to win an election, the odds of winning were too long for any challenger to step into the fray. At the State level however, things remain fairly competitive. North Mecklenburg has parts of two NC House Districts and one NC Senate district. While Senator Jeff Tarte (R) of Cornelius has the NC Senate 41 district fairly well wrapped up, on the House side things are much tighter. Those seats are NC House 92 held by Rep Charles Jeter (R) of Huntersville and NC House 98 to be held by newly elected Rep John Bradford (R) of Cornelius. According to the latest Civitas Institute rankings of partisanship in legislative districts, NC-92 was the only district in the state won by a Republican in a Democratic leaning district. The district has a 2012 Civitas Partisan Index (CPI) rating of D+1. Jeter won the district this year with 52.5% of the vote – an increase over his margin of victory in 2012 at 51.4%. In NC House 98, Bradford did win Speaker Thom Tillis’s old seat by a fairly wide margin – gaining 55% of the vote. That slightly outpaced the CVI rating for this district of R+9. However, that high CVI rating should not be take as an indication this district is the result of gerrymandering. It is actually down from the 2011 rating of R+11. In fact all of the districts representing North Mecklenburg have seen decreases in the Republican-leaning nature of their districts. Another analysis done by Professor Michael Bitzer of Catawba College shows more Mecklenburg precincts outside of Ccarlotte becoming more “blue” or at least less "red" in recent years. As an example, the precinct around Davidson College used to be the only blue precinct in the whole North Mecklenburg area. Between 2008 and 2012, other blue precincts joined NC-98 on its southern edge in North Charlotte. Thus, its reduced CVI rating. So, what does all this mean to you the voter? It means that local voters should continue to hold their elected representatives accountable. Particularly, at the State Legislative level they still have incentive to listen. As the Mecklenburg electorate continues to change, their jobs in Raleigh will depend on it. Davidson’s November monthly Town Board meeting saw one of the more spirited public hearings in recent memory. Like a stunned boxer taking a flurry of punches in the opening round, the Town Board and Town Staff did not respond in real-time to citizen complaints about proposed changes to the town’s planning ordinance. Per the town's own notes on the meeting fully 16 of 19 commenters opposed some aspect of what the town planners propose changing. The public hearing is scheduled to continue at next week’s monthly meeting on December 9th, and it will be interesting to see if the Town comes out with a different strategy for Round 2. The planning ordinance rewrite effort has gone on for two years already, and it’s costs have been adding up. Initially, the Town brought in the Lawrence Group – a national planning and design firm whose local office was founded with the help of Davidson’s Assistant Town Manager, Dawn Blobaum, back in the 1990’s before she jumped from the private sector over to town hall. The firm helped with an assessment and some of the initial work to the tune of roughly $75,000 for its efforts. However, that represents just a small percentage of the overall cost. As the project drug on, Town staff has taken direct control of the effort – spending an untold number of hours on the project. A cost for all of that work was not available from the Town. It is fair to say that a lot of time and expense has gone into the project, and to the town’s credit they have tried to get public input. Part of the reason the first hearing was so well attended is that the Town spent $1300 sending 1400 letters to every household in the community impacted by the plan’s various rezonings. It is unfortunate that after all that time and effort, the proposals produced seem to be taking the town in the wrong direction according to many. 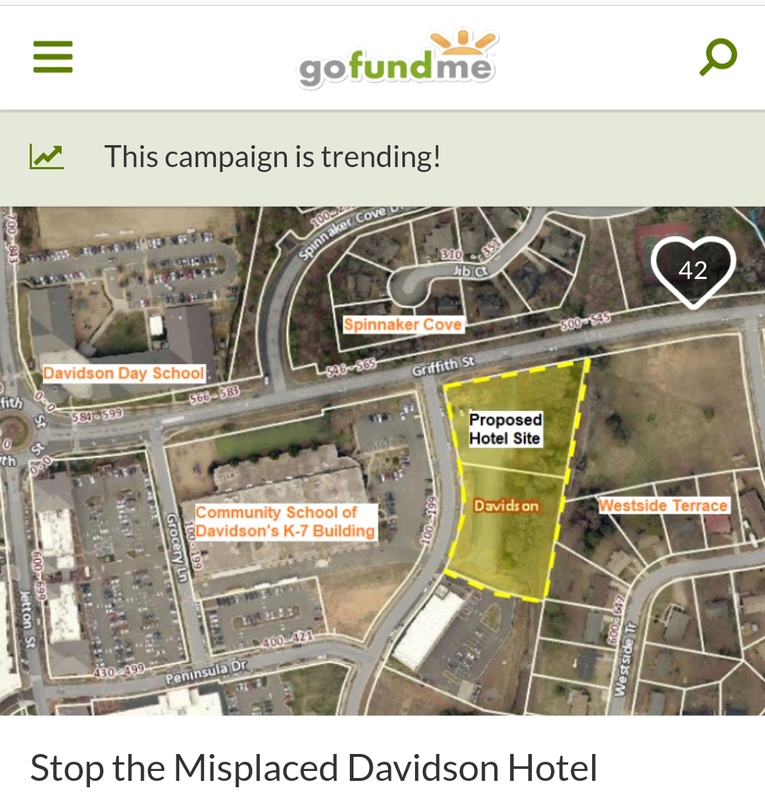 It is a direction most residents and visitors to Davidson will be very surprised to see. 1. The new Village Edge zoning designation allows 4-story buildings in town on certain specifically designated properties. Several of these these are on or just off Main Street. Does this sound like what you think if when you think of “Davidson”? 2. Retail would be allowed in the Village Infill area on any corner lot. This will mix commercial uses into neighborhoods that have always been purely residential. How would you like a bar or restaurant next door, or any other storefront for that matter replacing your neighbor’s front porch? 3. Developers will have more “offsite” options for meeting their affordable housing requirement. In practice, this will allow high-end developments to potentially push their affordable housing requirement into other neighborhoods. Does that sound like it's what middle-class residents want who already live in the town’s more moderately priced communities? As was mentioned by Commissioner Graham after the hearing paused November 11th, the proposed changes impact more than just the 1400 property owners directly impacted by the rezonings. Everyone who lives in Davidson will be impacted by these changes in some way. Davidson officials were given a lot to think about at the November meeting. Hopefully, they will come back with better answers than they did in Round 1, and hopefully they will once again have a full house to hear them. The bell rings for Round 2 at 6 PM on Tuesday December 9th at Davidson Town Hall.